Media Options for Bodily Intercession Class! This is to respond to inquiries about live streaming, DVD packaging, etc. We are still working out the strategy, but I want you to have time to work the best plan for you. Live Streaming — That is in the works for one session. DVD Sales — Yes, we will package and sell this teaching. Out of State Attendees — Many want to attend but live out-of-state. To protect your investment (registration), the team is working on a password protected conference line. We will ask for registration to cover the cost of producing and shipping your manual to you. Otherwise, you’ll receive a modified outline to follow along. Listening Parties — Maybe you’ll want to gather and attend this study long distance with a group. You may email the tech team directly at thequeenlife@gmail.com for more details. Thank you for your support and interest. There are so many exciting developments happening. The Lord is providing technology and other needs to help us offer a more excellent product. Your donations and registrations are not just for events, but they go a long way for what comes next with The Queen Life. 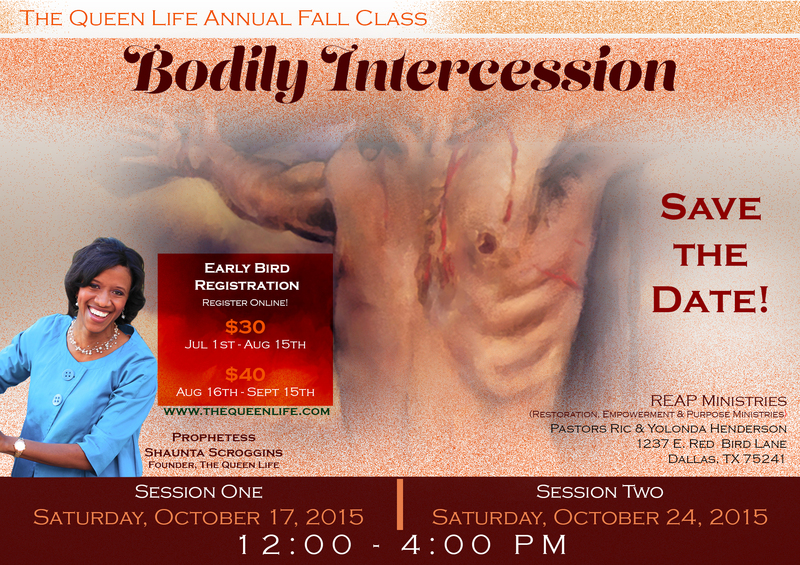 Updates will come through the blog, so please spread the word about the Annual Fall Class on Bodily Intercession! Let us know your interest in this option via email or The Queen Life Facebook page.